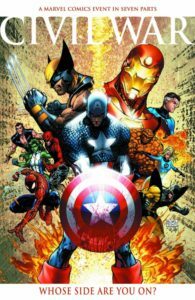 A comprehensive guide to line-wide Marvel Events – including story overviews, characters, issue lists, and how they can be read via omnibuses, hardcovers, and trade paperbacks. Part of Crushing Krisis’s Crushing Comics. Last updated November 2018 with titles scheduled for release through February 2019. Secret Wars. Inferno. Age of Apocalypse. Civil War. Secret Invasion. Avengers vs. X-Men. When it comes to epic-sized comic book events, Marvel Comics is the all-time champion. These line-wide Marvel Events are overarching stories that can involve dozens of Marvel heroes – if not all of them, all at once! Events occur as either or both of direct crossovers between ongoing titles and special limited-series. That can make them hard to keep track of, especially at the current rate of one or more events each year. It’s also hard to track down every issue or graphic novel. It’s easy to miss issues or buy the same comic in overlapping collections. That’s why I created this page – it includes summaries, issue lists, and collection info for every major Marvel event, ever. Click the links below to leap down the page to the corresponding section. I have omitted most line-specific crossovers with only one or two cross-line spinoffs, such as X-Men’s Mutant Massacre and Fall of the Hulks. Marvel’s first limited series, which pitted Earth’s greatest heroes against each other as pawns in a game with cosmic stakes. The event would be lightly retconned in a pair of later Avengers annuals. 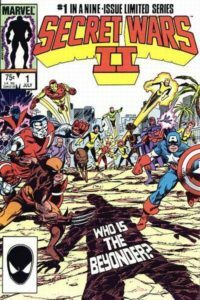 Characters: Though this was primarily an Avengers story, it prominently featured the X-Men and Fantastic Four (but not Spider-Man!) and several international heroes like Darkstar. Marvel revisited the idea of a cosmic being pitting heroes against each other in a high stakes game of war with this year-long, 12-issue maxi-series. Godlike entity The Beyonder whisks a cross-section of heroes and villains to a Battle World of his design to fight for supremacy. Characters: The entire early-80s X-Men team (less Kitty Pryde, but plus Magneto!) 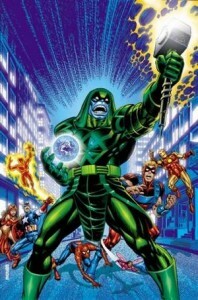 participates in the epic, alongside 3/4 of the Fantastic Four, an abbreviated group of Avengers, Spider-Man, and Hulk – plus a selection of their super-villains, including Dr. Doom, Dr. Octopus, Kang, and most of Thor’s rogues’ gallery. 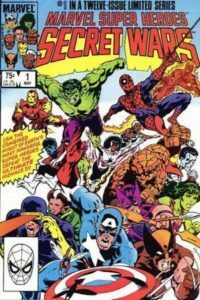 Unlike many comic events with tie-in issues in the ongoing titles of their stars, Secret Wars did not bleed into any other books during its run. Characters were whisked away and returned with little time passing in their own titles – sometimes between panels! In 2015, Secret Wars I and II were reprinted in an all-inclusive box set [eBay] of eleven standard-size hardcovers. Unfortunately, that pulled in a lot of weak and not especially relevant material along with a small amount of coveted stuff I’ll cover the Secret Wars I books here, and the Secret Wars II books below. Marvel Super Heroes Secret Wars Aftermath Premiere HC, collecting retcon stories referring to the event: Thor (1966) #383, Code Of Honor #3, She-Hulk (2004) #10, Deadpool Team-Up (1998) #1, Marvels: Eye Of The Camera #4, Quasar #8, Fantastic Four (1961) #351, Thanos #8-10, and material from Fantastic Four Annual #23-24 and #26-27. The aftermath of the event was felt by many characters – none moreso than Spider-Man, who inherited his black symbiote suit from the ordeal. Also, the Thing left the Fantastic Four for a year in the wake of the event. Thor (1966) #383: Collected in the Omnibus, above. This is an actual retroactive tie-in issue, occurring between Secret Wars #3 and 4. Also, see Thor. 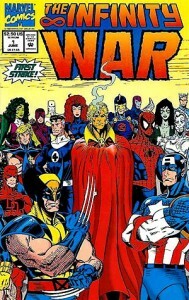 Marvel tried to strike gold a second time with a sequel to Secret Wars – this time occurring on Earth and involving into dozens of tie-in issues. In this saga, Earth’s heroes must repel a meddling and reality-warping Beyonder from their planet. Characters: This saga really did hit the entire Marvel Universe, with nearly every ongoing title including a tie-in issue. Dr. Doom and Mephisto feature prominently. In 2015, Secret Wars I and II were reprinted in an all-inclusive box set [eBay] of eleven standard-size hardcovers. This broke the massive Secret Wars II Omnibus into four books! I’ve listed them below. Secret Wars II Vol. 1 Premiere HC, collecting Secret Wars II #1-3, New Mutants (1983) #30, Captain America (1968) #308, Uncanny X-Men (1981) #196, Iron Man (1968) #197, Web of Spider-Man (1985) #6, Amazing Spider-Man (1963) #268, Fantastic Four (1961) #282 andAvengers (1963) #260. 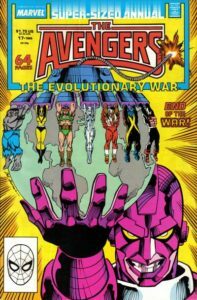 Marvel’s first all-Annuals crossover, where each of the summer double-sized annual issues was a single, largely self-contained chapter in a larger story of the High Evolutionary trying to force Earth’s denizen’s to take the next steps on their evolutionary path. Characters: The X-Men, Avengers, Fantastic Four, and Spider-Man all serve significant roles in this event, which began in the pages of X-Factor and ends thanks to the Avengers. The Omnibus includes (in order) X-Factor Annual 3, Punisher Annual 1, Silver Surfer Annual 1, New Mutants Annual 4, Fantastic Four Annual 21, Amazing Spider-Man Annual 22, Uncanny X-Men Annual 12, Web of Spider-Man Annual 4, West Coast Avengers Annual 3, Spectacular Spider-Man Annual 8, and Avengers Annual 17. The X-Men take the lead in a Marvel line-wide crossover for the first time! Inferno stemmed from character developments to Madelyne Prior in Uncanny X-Men and Illyana Rasputin in New Mutants, causing a demonic infestation of New York City. 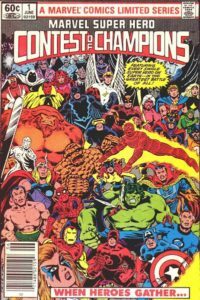 Characters: The X-Men, X-Factor, and New Mutants drive the central event, but tie-ins included the titles of all New York-based characters, including The Avengers, Fantastic Four, Daredevil, and Spiderman. 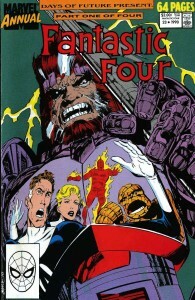 Inferno was Marvel’s first line-wide crossover not driven by a limited series and including direct crossover between monthly issues of ongoing titles. A pair of 2016 paperbacks broke the story into two parts and pulls in some tie-in issues that had been relegated to the original “Crossovers” HC. Inferno, Volume 1 collects Power Pack (1984) #40, 42-43; X-Factor (1986) #33-36; X-Terminators #1-4; Uncanny X-Men #239-240; New Mutants (1983) #71-72. The core of UXM and X-Factor issues are also collected in Essential X-Men Vol. 9. Additional non-X issues are collected in Inferno Crossovers hardcover [eBay], which includes a pair of Excalibur issues (the title was not tightly integrated into the X-line until the mid-90s): Power Pack (1984) #40 & #42-44, Avengers (1963) #298-300, Fantastic Four (1961) #322-324, Amazing Spider-Man (1962) #311-313, Spectacular Spider-Man (1976) #146-148, Web of Spider-Man #47-48, Daredevil (1964) #262-263 & 265, Excalibur (1988) #6-7, and Cloak & Dagger (1988) #4. Individual issues are also collected in various TPB volumes, by title. Another line-wide crossover via Annuals, this time telling the story of the Atlantean Serpent Crown and the return of the Serpent God Set. This story was strictly serialized, with each issue directly progressing from the prior. Characters: X-Titles played a relatively large part in this evolving story, though it is ultimately driven by the Avengers and Fantastic Four. Namor features prominently. A line-wide event dispersed through individual runs in many different ongoing series, where Loki convinced villains to cross over to fight atypical foes. Characters: The event mostly focused on The Avengers, with tie-ins from Fantastic Four and Spider-Man. 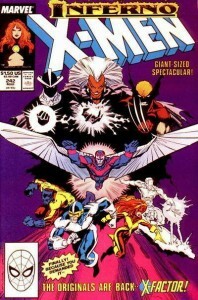 X-titles participated in this crossover, but were not central to the main theme – though, the Uncanny X-Men issues of Psylocke’s transformation are considered modern-day essentials. Main story collected in Acts of Vengeance Omnibus [eBay], including Avengers #311-313 and Annual 19, Avengers Spotlight (1989) #26-29, Avengers West Coast (1989) #53-55, Captain America (1968) #365-367, Iron Man (1968) #251-252, and Thor (1966) #411-413. Additional issues collected in Acts of Vengeance Crossovers Omnibus [eBay], including Fantastic Four #334-336; Wolverine (1988) #19-20; Dr. Strange (1988) #11-13; Incredible Hulk #363; Punisher #28-29; Punisher War Journal #12-13; Marc Spector: Moon Knight #8-10; Daredevil #275-276; Power Pack #53; Alpha Flight (1983) #79-80; New Mutants #84-86; Uncanny X-Men #256-258; X-Factor #49-50; Web of Spider-Man #64-65; and the Damage Control mini-series. After two years of line-wide annual crossovers, 1990 marked the beginning of a new summer crossover strategy for Marvel. They grouped their titles into fan-friendly lines of three-to-five titles and ran a series of smaller crossovers. This first foray yielded the classic “Days of Future Present” story that further solidified the link between the future fate of the X-Men and Fantastic Four. Though the crossovers themselves were not a line-wide event, the crossover theme and graphic design of the event was applied uniformly across all annuals – which is why they are listed in this guide. Days of Future Present: Fantastic Four Annual 23, 2, New Mutants Annual 6, X-Factor Annual 5, and Uncanny X-Men Annual 14. See Uncanny X-Men for collection information. Lifeform: Punisher Annual 3, Daredevil Annual 6, Incredible Hulk Annual 16, and Silver Surfer Annual 3. Not collected except for Hulk and Punisher in Essential Punisher, Vol. 3. Spidey’s Totally Tiny Adventure: Amazing Spider-Man Annual 24, Spectacular Spider-Man Annual 10, and Web of Spider-Man Annual 6. See Spider-Man for collection information. The Terminus Factor: Captain America Annual 9, Iron Man Annual 11, Thor Annual 15, West Coast Avengers Annual 5, and Avengers Annual 19. See Avengers for collection information. In a second year of a smaller-scale of annual summer crossovers, Marvel slightly shuffled their titles for a different line-up of heroes in each story compared to the prior year. None of this year’s events were particularly notable, though Kings of Pain featured the debut adventure of X-Force, and The Vibranium Vendetta starred Black Panther and Ultron with an appearance from Venom! Kings of Pain: New Mutants Annual 7, New Warriors Annual 1, Uncanny X-Men Annual 15, and X-Factor Annual 6. See New Mutants for collection information. The Korvac Quest: Fantastic Four Annual 24, Thor Annual 16, Silver Surfer Annual 4, and Guardians of the Galaxy Annual 1. Not collected. Subterranean Wars: Avengers Annual 20, Incredible Hulk Annual 17, Namor The Sub-Mariner Annual 1, Iron Man Annual 12, and West Coast Avengers Annual 6. Not collected except for the Hulk annual in Hulk Visionaries: Peter David, Vol. 7. The Vibranium Vendetta: Amazing Spider-Man Annual 25, Spectacular Spider-Man Annual 11, and Web of Spider-Man Annual 7. See Spider-Man for collection information. The Von Strucker Gambit: Daredevil Annual 7, The Punisher Annual 4, and Captain America Annual 10. Not collected except the Punisher annual in Essential Punisher, Vol. 4. 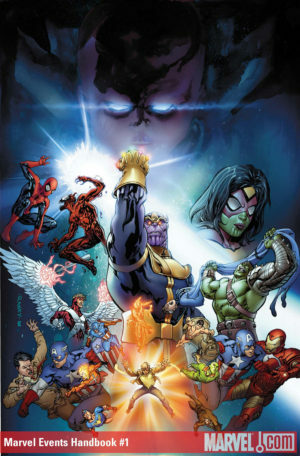 The first line-wide crossover focused on Marvel’s cosmic heroes, The Infinity Gauntlet saw villain Thanos wielding the Infinity Gems to master the universe in his continuing efforts to court Death. 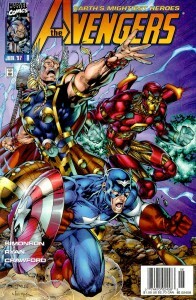 This crossover used the modern model of a primary limited series (written by Jim Starlin) with a number of tie-in titles. Characters: Though Infinity Gauntlet includes nearly every Marvel hero, it mostly focuses on Thanos and Adam Warlock. Silver Surfer plays a prominent role. 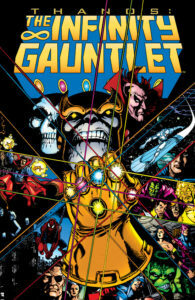 Marvel released an Infinity Gauntlet Omnibus oversize hardcover in 2014 containing Infinity Gauntlet #1-6, plus lead-ins and tie-ins including Silver Surfer #34-38, 40, 44-60; Thanos Quest #1-2; Cloak & Dagger (1988) #18; Spider-Man (1990) #17; Incredible Hulk #383-385; Dr. Strange, Sorceror Supreme #31-36; Quasar #26-27; and Sleepwalker #7. A lead-in story from Silver Surfer #34-38, The Thanos Quest #1-2, and Logan’s Run #6 is collected as Silver Surfer: The Rebirth of Thanos hardcover and paperback. Infinity Gauntlet #1-6 are collected in paperback and Marvel Premiere Classic hardcover. An Infinity Gauntlet Deluxe 2019 paperback collects those issues along with promotion and background materials (think of it as a Director’s Cut). It’s collected in oversize hardcover format in 2019 as Infinity by Starlin & Hickman Omnibus (along with the 2013 Infinity). Infinity Gauntlet Aftermath paperback collects Silver Surfer (1987) #60-66 and material from Annual 5, Dr. Strange: Sorcerer Supreme #36, and Warlock & the Infinity Watch #1-6. 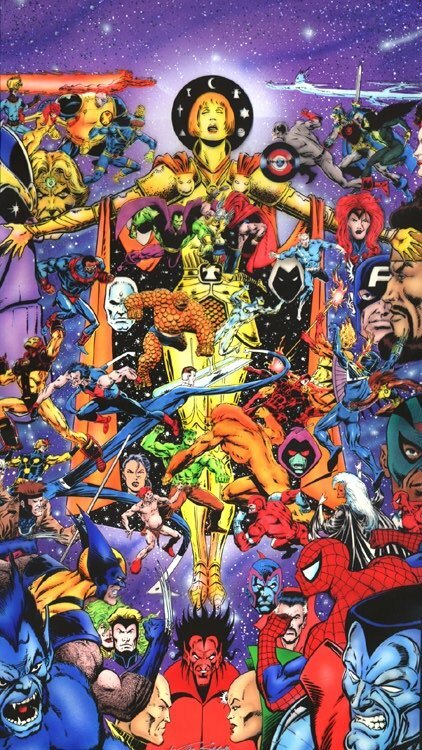 In 2018, the 1990s Infinity Trilogy was reprinted in an all-inclusive Infinity Gauntlet Box Set Slipcase of 12 standard-size hardcovers. This set offers a truly comprehensive coverage of the events, as well as their tie-ins and aftermaths. The set also includes books for Infinity War and Crusade, the contents of which are covered in their sections below. This crossover between the Avengers, Avengers solo titles, and Quasar never quite reached linewide proportions, but at the time it was one of Marvel’s most far-reaching direct crossover between monthly titles. Collects the first half of the crossover from Avengers #345-346, Avengers West Coast (1989) #80-81, Captain America (1968) #398-399, Iron Man (1968) #278, Quasar (1989) #32-33, Thor (1966) #445, and Wonder Man (1991) #7-8. Collects the second half of the crossover from Avengers #347, Avengers West Coast (1989) #82, Captain America (1968) #400-401, Iron Man (1968) #279, Quasar (1989) #34-36, Thor (1966) #446, Wonder Man (1991) #9, and What If…? (1989) #55-56. 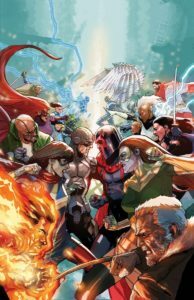 Marvel’s final year of summer annual crossovers expanded to six storylines with the addition of new titles Darkhawk, X-Force, and X-Men Vol. 2. Citizen Kang has since been referenced, and Shattershot includes the final X-Men work from Jim Lee. Assault on Armor City: Darkhawk Annual 1, West Coast Avengers Annual 7, and Iron Man Annual 13. Not collected. Citizen Kang: Captain America Annual 11, Thor Annual 17, Fantastic Four Annual 25, and Avengers Annual 21. Collected as Avengers: Citizen Kang. The Hero Killers: Amazing Spider-Man Annual 26, Spectacular Spider-Man Annual 12, Web of Spider-Man Annual 8, and New Warriors Annual 2. See Spider-Man for collection information. The Return of the Defenders: Incredible Hulk Annual 18, Namor The Sub-Mariner Annual 2, Silver Surfer Annual 5, and Dr. Strange Sorcerer Supreme Annual 2. See The Defenders for collection information. Shattershot: X-Men Vol. 2 Annual 1, Uncanny X-Men Annual 16, X-Factor Annual 7, and X-Force Annual 1. See X-Men, Vol. 2 for collection information. The System Bytes: The Punisher Annual 5, Daredevil Annual 8, Wonder Man Annual 1 (Thanks, Stephen!) and Guardians of the Galaxy Annual 2. Not collected except for the Punisher annual in Essential Punisher, Vol. 4. This second Jim Starlin cosmic limited series explored the ramifications of the Infinity Gauntlet’s conclusion, once again pitting Marvel’s heroes against a universal threat. This is represented in part by a pack of evil doppelgangers of heroes. As with Gauntlet, a number of ongoing titles had tie-in issues. Characters: This focuses on Adam Warlock and Thanos, but Quasar and the Fantastic Four also make significant appearances. There are also many familiar doppelgangers! The X-Men are not prominently involved in this event. Infinity War Omnibus (2019 oversize hardcover) collects Infinity War #1-6, plus lead-ins and tie-ins including Fantastic Four (1961) #366-370; Spider-Man (1990) #24; Deathlok (1991) #16; Daredevil (1964) #310; Warlock and The Infinity Watch #7-10; Doctor Strange, Sorcerer Supreme #42-47; Silver Surfer (1987) #67-69; Wonder Man (1991) #13-15; Alpha Flight (1983) #109 (excerpts) & 110-112; Silver Sable & The Wild Pack #4-5; Guardians Of The Galaxy (1990) #27-29; Quasar #37-40; New Warriors (1990) #27; Marc Spector: Moon Knight #41-44; Nomad (1992) #7; Sleepwalker #18; and material from Captain America (1968) #408; Marvel Comics Presents (1988) #108-112. Infinity War #1-6 are collected in paperback, which also includes Warlock and the Infinity Watch #7-10 (and, possibly a brief story from Marvel Comics Presents #108-111). The contents of the five books focused on Infinity Gauntlet are covered above. The box also includes three additional books covering Infinity Crusade, the contents of which are covered in their sections below. A third installment in Marvel’s Jim Starlin cosmic saga, this limited series follows a second thread of ramifications from the original Infinity Gauntlet. The result pits heroes against heroes as the “good” portion of Adam Warlock – The Goddess – wages war to control the universe. The main story of this crossover alternated between the titular limited series, Warlock and the Infinity Watch, and Warlock Chronicles. Characters: This focuses on Adam Warlock, with significant appearances by Thanos, Mr. Fantastic, Iron Man, Vision, Silver Surfer, and Professor X .
Infinity Crusade, Vol. 1: Collects Infinity Crusade #1-3, Warlock Chronicles #1-3, and Warlock and the Infinity Watch #18-19. Infinity Crusade, Vol. 2: Collects Infinity Crusade #4-6, Warlock Chronicles #4-5, and Warlock and the Infinity Watch #20-22. The contents of the five books focused on Infinity Gauntlet and four books covering Infinity War are listed above. Infinity Crusade Premiere HC is effectively both of the previous paperbacks, collecting Infinity Crusade #1-6, Warlock Chronicles #1-5, and Warlock and The Infinity Watch #18-22. Thor (1966) #463-467: See Thor. When Charles Xavier’s son Legion travels back in time with the intention of killing Magneto, his actions cause an alternate timeline to form. Without Xavier’s leadership and peaceful philosophy to stop him, Apocalypse usurps control of the entire mutant race and enslaves the entire world. This innovative crossover was not truly line-wide, but it interrupted the monthly run of all X-titles to replace them with four months of tightly-coordinated alternate-reality versions of themselves. While non-X characters appeared throughout the tale, the crossover did not have any effects or tie-ins with non-X titles. Characters: Every X-Men active as of 1995 is represented in the initial run of the story save for Psylocke. Wolverine, Jean Grey. Magneto, and Sabretooth all appear very prominently. Appearances of non-X characters are largely limited to a pair of X-Universe tie-ins. The complete “present day” portion of this story is collected in X-Men: Age of Apocalypse Omnibus (reprinted in 2016), which contains lead-ins Uncanny X-Men (1963) #320-321, X-Men (1991) #40-41, and Cable (1993) #20, and then the main thrust of the story in X-Men Alpha, Amazing X-Men #1-4, Astonishing X-Men (1995) #1-4, Factor X #1-4, Gambit & The Externals #1-4, Generation Next #1-4, Weapon X (1995) #1-4, X-Calibre #1-4, X-Man #1-4, X-Men Omega, Age Of Apocalypse : The Chosen and X-Men Ashcan #2. The history (and future) of the timeline – as well as some ancillary present-day stories – are collected in X-Men: Age of Apocalypse Omnibus Companion – X-Men Chronicles #1-2, Tales from the Age of Apocalypse #1-2, X-Man #-1 & 53-54, Blink #1-4, X-Universe #1-2, Exiles (2001) #60-61, X-Men: Age of Apocalypse (2005) one-shot & #1-6, What If? (1989) #77 & 81, What If? X-Men Age of Apocalypse; and portions of Hulk: Broken Worlds #2, X-Men Prime, X-Man Annual 96, X-Men: Endangered Species, Exiles: Days of Then & Now, and the Official Handbook of the Marvel Universe: Age of Apocalypse 2005. The timeline’s history and present day were previously collected in a single integrated order in Age of Apocalypse Epic Volumes 1, 2, 3, and 4, which are entirely covered by both Omnibus volumes. 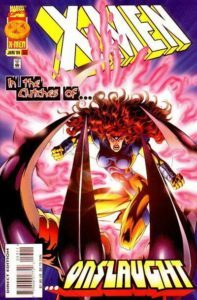 These volumes started in Volume 1 from the oldest chronological stories in X-Men Chronicles, included retcon stories like X-Man and Blink, and ended with X-Men: Omega & Prime. However, they have none of the real world X-Men run-up stories, which are in the Omnibus. AOA was reprinted in trades again starting in 2015, but with different contents than the last set of trades! The middle three editions cover the Omnibus (including the real world lead-in stories) plus X-Universe, but the Companion (minus X-Universe) is split between a “Dawn” volume adding the prequel stories and the “Twilight” adding the follow-ups. The 2005 revisitation of the series was previously collected as X-Men: The New Age of Apocalypse. 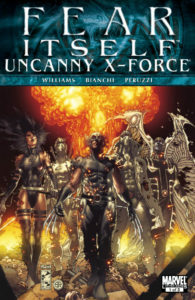 Years later, the timeline is continued in Uncanny X-Force #11-19 (see Uncanny X-Force), which leads to Age of Apocalypse Vol. 1 and Vol. 2, and finally X-Termination. 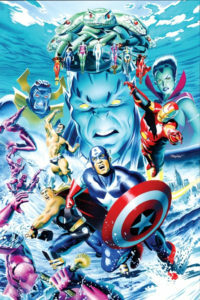 Capitalizing on five years of accumulated hints across the X-Men titles, this long-simmering plot exploded to threaten the entire Marvel Universe and resulted in the cancellation of the entire Avengers and Fantastic Four lines of titles, all of which would see relaunch in their own separate continuity. 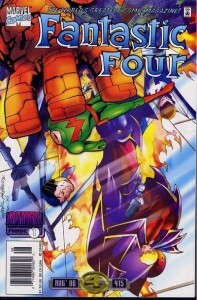 Onslaught consisted of two framing issues bearing the Onslaught title, a direct crossover in a core of X-Men books and Fantastic Four, and outlying tie-in issues in the X-Men, Avengers, and Spider-Man lines. Characters: Though this event began in the X-Men line, it is a true line-wide event that touched nearly every ongoing title (although, Spider-Man is involved only glancingly). The Fantastic Four play a significant role, and the Avengers figure heavily into the climax. There have been three different printed sequences of Onslaught collections, presented below with their associated issue ranges. Cable (1993) #32-36; Uncanny X-Men (1963) #333-337; X-Force (1991) #55 & 57-58; X-Man #15-19; X-Men (1991) #53-57 & Annual ’96; X-Men Unlimited (1993) #11; Onslaught: X-Men, Marvel Universe, Epilogue; Avengers (1963) #401-402; Fantastic Four (1961) #415; Incredible Hulk (1968) #444-445; Wolverine (1988) #104-105; X-Factor (1986) #125-126; Amazing Spider-Man (1963) #415; Green Goblin #12; Spider-Man (1990) #72; Iron Man (1968) #332; Punisher (1995) #11; Thor (1966) #502; X-Men: Road to Onslaught 1; and material from Excalibur (1988) #100, Fantastic Four (1961) #416. Note that the omnibus does not collect X-Men #50 from the “Prelude to” Epic TPB, below – that issue was recollected in a series of “Road to Onslaught” paperbacks rather than be repeated in the omnibus. However, it adds X-Force #55, which was not collected in paperback. The “Complete Epic” is a five-book paperback collection of Onslaught material. I checked these ranges with the actual books open in front of me – many other sites have them listed incorrectly. Collects (in this order) X-Men #50, Cable #32, Uncanny X-Men #333, X-Man #15-17, and Cable #33. Also, interspersed with those entire issues are related portions of UXM #287, XMv2 #25, X-Man #10, UXM #322, Wolverine #93, XMv2 #46, XMv2 #49, X-Force #52, X-Men Unlimited #10, UXM #331, Wolverine #100, Generation X #15, Cable #31, X-Men Unlimited #11, and Excalibur #99. Collects X-Men #53-54, Uncanny X-Men #334-335, Avengers #401, Onslaught: X-Men, X-Man #18, X-Force #57, Cable #34, Incredible Hulk #444, and additional excerpts listed below. The correct reading order is: XMv2 #53, UXM #334, XMv2 #54, (one page of FF #414), (one page of Avengers #400), X-Men: Onslaught, UXM #335, Avengers #401, FF #415, Cable #34, and Hulk #444. Collects Amazing Spider-Man #415, Fantastic Four #415, Green Goblin #12, Punisher #11, Spider-Man #72, X-Factor #125-126, X-Force #57, X-Man #18, and Wolverine #104. The correct reading order is: (several pages of Excalibur #100), Wolverine #104, X-Factor #125-126, (final page of Sensational Spider-Man #9), Amazing Spider-Man #415, Green Goblin #12, Spider-Man #72, X-Man #18, X-Force #57, and Punisher #11. Collects Avengers #402, Cable #35, Incredible Hulk #445, Invincible Iron Man #332, Thor #502, Uncanny X-Men #336, Wolverine #105, X-Force #58, X-Man #19, and X-Men #55. The correct reading order is: XMv2 #55, UXM #336, Cable #35, X-Force #58, X-Man #19, Hulk #445, Iron Man #332, Avengers #402, Thor #502, and Wolverine #105. This more sprawling version is no longer in print. I do not own these volumes, so I cannot verify their contents or order. Collects Uncanny X-Men #322 & 334, X-Men #53-54, Wolverine #104, and Onslaught: X-Men. Collects X-Man #18-19 and X-Force #57-58. Collects Uncanny X-Men #335, Avengers #401, Fantastic Four #415, and X-Men #55. Collects Cable #34-35 and Incredible Hulk vol. 1 #444-445. Collects X-Factor #125, Amazing Spider-man #415, Green Goblin #12, Punisher #11, and Spider-man #72. Collects Avengers #402, X-Men #56, Uncanny X-Men #336, and Onslaught: Marvel Universe. All of the Onslaught collections omit a handful tie-in issues, including Generation X #18-19, Thor #502, and X-Men Unlimited #12. As a result of Onslaught, the Avengers and Fantastic Four lines splintered into their own pocket universe for a year before returning to the main Marvel 616-timeline and a series of newly relaunched titles, with high-profile creators like Jim Lee and Rob Liefield. Characters: Fantastic Four and The Avengers, which for this purpose included Captain America, Iron Man, Thor, Scarlet Witch, Hawkeye, Nick Fury, Wonder Man, Black Knight, Swordsman, Hellcat, Vision, Hank Pym, and The Wasp. Dr. Doom and Enchantress are major foes. Hulk’s appearances leave some room for question, since he was also appearing in the main Marvel Universe at the time! Heroes Reborn Omnibus (2019 oversize hardcover, ISBN 978-1302918040) – Collects Heroes Reborn #1/2, Captain America (1996) #1-12, Avengers (1996) #1-12, Fantastic Four (1996) #1-12, Iron Man (1996) #1-12, and material from Incredible Hulk (1968) #450. Note: The four Heroes Reborn series crossed over at issue #13 for a story titled “World War III” that has not been collected because it featured Wildstorm studios characters. This mini-series followed up on the original Marvel event by offering one-on-one battles with fan-voted outcomes. Contest of Champions II #1-6 are collected in trade paperback. A council of representatives from most of the sentient worlds in our universe decide that Earth’s heroes have meddled in galactic events beyond their reach one too many times (in this particular instance, Professor X is to blame). Sounds reasonable, right? Except, as punishment (and protection of their planets), they render Earth’s solar system as an intergalactic prison for the worst offenders in the galaxy! 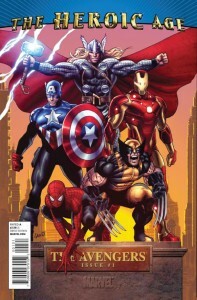 The main plot of the crossover is driven by a one-shot and subsequent three-issue mini-series, but the action spills into all of the Avengers and X-Men ongoing titles. Characters: The Avengers, Thor, Iron Man, Ms. Marvel, Silver Surfer, Gambit, Bishop. The prelude Maximum Security: Dangerous Planet #1 and the main series of Maximum Security #1-3 are collected in Avengers/X-Men Maximum Security, along with Captain America (1998) #36, Thor (1998) #30, Uncanny X-Men #387, Bishop: the Last X-Man #15, Iron Man (1998) #35, Avengers (1998) #35, Gambit (1999) #23, X-Men (1991) #107, and X-Men Unlimited (1993) #29. This event is set up by the events of the Avengers Infinity mini-series. This continues the Jim Starlin penned saga of the anti-hero Thanos, yet it is a mere mini-series – not a true line-wide event. I have included it here simply to complete the “Infinity” cycle of Starlin mini-series. Hybrid clones of Thanos and five powerful heroes – Professor X, Doctor Strange, Gladiator, Iron Man, and Galactus – are set loose and intent on ending the universe as we know it! Characters: Thanos, Adam Warlock, Captain Marvel, Dr. Strange, Silver Surfer, Spider-Man, and Pip the Troll. 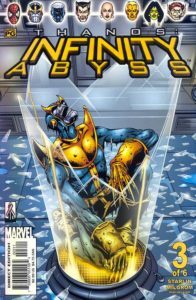 Infinity Abyss #1-6 are collected in trade paperback (and previously in an out-of-print paperback ). They are recollected in full by Guardians of the Galaxy: Road to Annihilation, Vol. 1. This story is prefaced by Thanos appearances in Avengers: Celestial Quest #1-8 and a run of Thor issues included in Thor by Dan Jurgens & John Romita Jr. Vol. 4. Thanos next appears in his own 2003 series, collected as Thanos: Redemption. 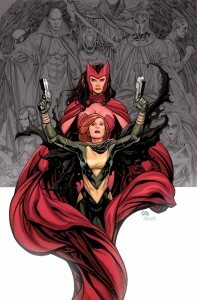 The Avengers, having just merged back into the original numbering of their first volume of release, are briskly deconstructed at the hands of writer Brian M. Bendis and the fractured psyche of The Scarlet Witch. This indirect crossover was centered in The Avengers, though its effects were felt throughout the entire Avengers line of titles. 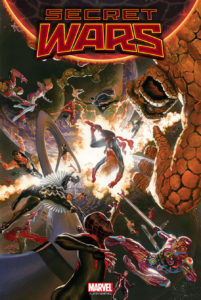 Though the Disassembled tag also affects Spider-Man and Fantastic Four, their crises do not directly tie into the main Avengers storyline in the main book and the titles of its three biggest heroes. Though this saga does not touch the X-Men, it can viewed as an extended prologue to the upcoming House of M crossover. Characters: Very nearly every Avenger ever! Prominently featuring Captain America, Iron Man, Scarlet Witch, Dr. Strange, She-Hulk, and Hawkeye. This Brian M. Bendis-penned Avengers-centric mini pits heroes against super-villains who have received a massive technology upgrade from a mysterious benefactor. Due to many delays in publication, this five-issue limited series stretched across two years. Characters: Nick Fury leads a team of Spider-Man, Captain America,Wolverine, Daredevil, and Luke Cage. Joss Whedon’s cast of Astonishing X-Men appear in issue #5. Fantastic Four also makes a limited appearance. Secret War #1-5 are collected in hardcover and paperback. Also includes Secret War: From the Files of Nick Fury (2005). Additional tie-in issues The Pulse #6-9 are collected in The Pulse, Vol. 2. This story indirectly leads to the 2009 series Secret Warriors. Marvel replicates the execution of Age of Apocalypse across nearly its entire line of titles by plunging the entire Marvel Universe into an alternate reality at the hands of the Scarlet Witch. 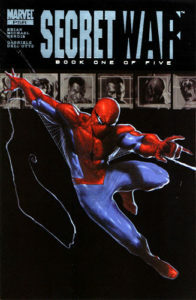 The main story takes place in an eight-issue limited series, with the alternate lives of various heroes playing out in their own titles (if their creators chose to play along – participation was optional). Both the X-Men and the Avengers would feel the far-ranging impact of this event. 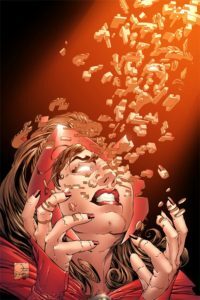 However, due to its status as an alternate reality story, none of the contents of the event itself directly impact the world aside from the final words spoken by Scarlet Witch. Some characters do gain new motivation from a glimpse at their alternate selves – especially Wolverine and Ms. Marvel. 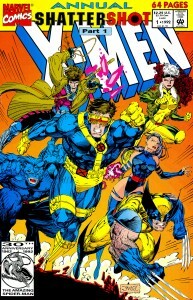 The X-Men’s portion of the fallout is collected in a series of trades under the “Decimation” banner, and unofficially in the relaunched X-Factor. Characters: Though this story affects the entire Marvel line, the main drives in the mini-series are The X-Men (largely Cyclops, Emma Frost, and Wolverine) & The Avengers (including Spider-Man). Magneto, Scarlet Witch, and Quicksilver. House of M #1-8 are collected in hardcover and paperback. Both Avengers Disassembled (above) and Excalibur, Vol. 3 can be considered prologues to this event, though neither are essential reading to understand the storyline. Additional tie-in issues were recently consolidated into a series of three oversized hardcovers, which are highly recommended for ease-of-collection. House of M: No More Mutants – Collects all of the ancillary mutant titles, plus Ms. Marvel – Mutopia X #1-5, New X-Men #16-19, Exiles #69-71, House of M: The Day After, and Giant-Size Ms. Marvel #1. House of M: Wolverine, Iron Man, Hulk – Collects runs of those characters, as well as one-offs Captain America #10, Pulse #10, and Cable & Deadpool #17. New Avengers, Vol. 4: The Collective is a non-Decimation epilogue to House of M, collected in hardcover and paperback, or in oversized hardcover. A wave of terror sweeps across the galaxy from where space meets the Negative Zone. As the destruction moves towards the home planet of the Nova Corps and the Skrull Homeworld, Marvel’s galactic heroes (and Galactus!) spring into action to try to contain it. Annihilation’s main story was told in a primary mini-series, while four supporting mini-series with the Annihilation banner addressed different fronts of the war. As a whole, it served to reintroduce Marvel’s cosmic line of heroes. Characters: Thanos, Drax and Cammi, Annihilus, Nova, Silver Surfer, Ronan The Accuser and The Kree, Gamora, Peter Quill (Starlord), and Moondragon. Annihilation Volume 1 oversized hardcover and paperback collects Drax the Destroyer #1-4, Annihilation Prologue, Nova #1-4. Annihilation Volume 2 oversized hardcover and paperback collects Silver Surfer #1-4, Super Skrull #1-4 and Ronan #1-4. 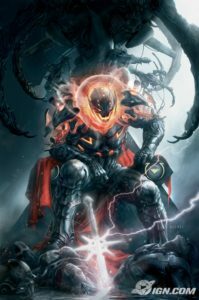 Annihilation Volume 3 oversized hardcover and paperback collects Annihilation #1-6, Annihilation: Heralds of Galactus #1-2 and the Annihilation: The Nova Corps Files handbook. The long out-of-print Thanos: Samaritan TPB acts as a prologue to this event. 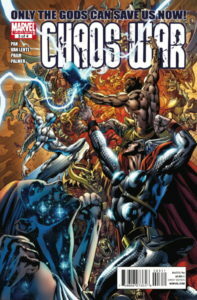 The 2007 Nova series was a spin-off of the event, with the first hardcover and paperback bridging to the next stage of this event sequence, Annihilation: Conquest (below). Additional background on the major characters of Annihilation is collected in Annihilation Classic hardcover and paperback. 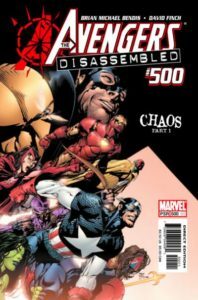 In 2006 Marvel took a major risk by splitting its heroes down the middle in a Civil War of epic proportions – the event touched almost 100 individual issues! It wasn’t a risky move just because of its epic scope. Civil War splintered the Avengers flagship just two years after they had been re-assembled, and just months after a decimation of the entire X-Men line. It also meant instituting an actual ideological divide between characters (and fans) that could not be easily resolved with a handshake at the end of the event. All the risk paid off. Civil War is a rich, multi-layered event that brought out the best in nearly every book it touched, and turned The Avengers into a diverse multi-book line to equal the X-Men. Though the main title moves relatively briskly without the associated events from tie-in titles, it’s still an incredibly compelling read – one of Marvel’s inarguable modern-day milestones. Characters: Though this event touches nearly all of the Marvel Universe, it specifically features Captain America, Iron Man, Spider-Man, Hank Pym, Luke Cage, Ms. Marvel, Wolverine, Tigra, Punisher, The Fantastic Four, and the New Warriors. The X-Men play an extremely limited role in Civil War, as they were still dealing with the ramifications of Decimation. As a result, their tie-in book is especially tangential. A Road to Civil War TPB acts as a prelude to this event, but a New Warriors lead-in was later repackaged as Civil War Prelude. 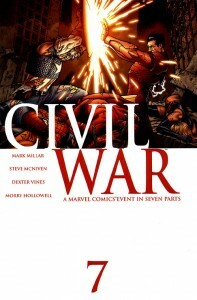 Civil War #1-7 are collected in hardcover (reprinted in 2016 and with a movie cover) and paperback. Black Panther issues starting at the end of Black Panther, Vol. 3 – The Bride, but continuing in Black Panther, Vol. 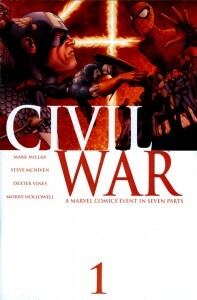 4 – Civil War, which was reprinted in 2016. Cable & Deadpool #30-32 – Civil War: X-Men Universe. See Cable & Deadpool for other collections. Captain America (5th series) #22-24 – Captain America by Ed Brubaker Omnibus, Vol. 1 & Captain America, Vol. 5 – Civil War. Re-collected in 2016 as Civil War: Captain America/Iron Man. Civil War: Front Line #1-12 in Civil War: Front Line Vol. 1 and Vol. 2. Reprinted as one volume in 2016. Civil War: The Confession – New Avengers (2005) Deluxe HC vol. 03. Re-collected in 2016 as Civil War: Captain America/Iron Man. Civil War: The Initiative & The Return in Civil War: Marvel Universe. Reprinted in 2016. Civil War: X-Men #1-4. Reprinted in 2016. Civil War: Young Avengers & Runaways #1-4. Reprinted in 2016. Fantastic Four #538-541 in Fantastic Four: Civil War. Reprinted in 2016. Iron Man #13-14 in The Invincible Iron Man, Vol. 3: Civil War. Re-collected in 2016 as Civil War: Captain America/Iron Man. Iron Man / Captain America: Casualties of War in Iron Man, Vol. 3 (above). Re-collected in 2016 as Civil War: Captain America/Iron Man. Winter Soldier: Winter Kills – Collected with Captain America (above). Re-collected in 2016 as Civil War: Captain America/Iron Man. Wolverine #42-48 in Wolverine: Civil War. Reprinted in 2016. X-Factor #8-9 -in Civil War: X-Men Universe. See X-Factor for other collections. Captain America vol. 5, #26-30 in hardcover and paperback, as well as in the Death of Captain American omnibus. Death of Captain America Omnibus is an epilogue that would drive the next several years of Captain America stories. Spider-Man: One More Day in hardcover and paperback is an epilogue that resets certain elements of Spider-Man’s continuity. It is despised by fans and critics alike. Silent War, which was an Inhumans-centric epilogue to both Civil War and House of M. It acts as a launching point for War of Kings (below). The Hulk takes center stage in his first ever line-wide crossover! Over the years, Bruce Banner has been a hero, a villain, and an unaligned force of sheer destruction. That meant he sometimes ran afoul of the heroes of the Marvel Universe, and eventually an elite group of heroes including Tony Stark and Professor Xavier decided that The Hulk was too dangerous to inhabit Earth! Their exile of Hulk to the outer reaches of space initiates the Planet Hulk storyline. Due to a twist at the end of Planet Hulk, an enraged Hulk returns to Earth set on a singular goal – to destroy the men who sent him to space, as well as all that they love! The event is followed by a brief epilogue, Aftersmash. Though Hulk is not typically Marvel’s most marquee hero, World War Hulk is a solid storyline that manages to weave itself into several lines of heroes. Characters: Hulk, Hulk’s Warbound team, and The Illuminati – Iron Man, Black Bolt, Professor X, Dr. Strange, and Mr. Fantastic. 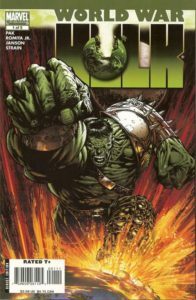 Planet Hulk is collected in hardcover and paperback, including issues #92-105 and Giant-Size Hulk. Next, World War Hulk #1-5 is available in hardcover and paperback, which also collect an Aftersmash one-shot. Supporting issues are collected ina number of tie-in volumes. World War Hulk: Marvel Universe (occasionally, World War Hulk: X-Men), collecting Avengers: The Initiative #4-5, Irredeemable Ant-Man #10, Iron Man #19-20, Ghost Rider #12-13, World War Hulk: X-Men #1-3. After the galaxy-wide destruction of Annihilation, another enemy takes advantage of the resulting chaos to vie for control of some of the oldest civilizations in the universe – The Phalanx! Originally an X-Men foe in the 1990s, the Phalanx are race of hive-minded techno-organic entities that sweep across worlds, assimilating their organic species. They infiltrate the Kree empire, completely subverting it … but it’s an even older villain who is behind their evil plot! Characters: The Phalanx, The Kree, The Badoon, Star-Lord, Ronan The Accuser, Wraith, Super-Skrull, Nova, Quasar, Moondragon, Adam Warlock, High Evolutionary, Ultron, and The Guardians of the Galaxy (including Rocket Raccoon, Groot, and Mantis). Annihilation: Conquest Omnibus collects this event in its entirety. Individual issues are listed below. Nova: Annihilation oversized hardcover collects Nova #1-12 and Annual 1. 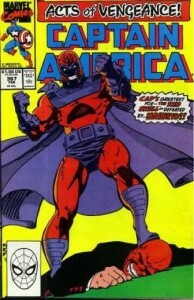 The second half of these issues are collected in Nova, Vol. 2. The nefarious, shape-shifting Skrulls have repeatedly infiltrated Earth’s society of super-heroes for decades, sometimes living for years as sleeper-agents playing the part of teammates and lovers. 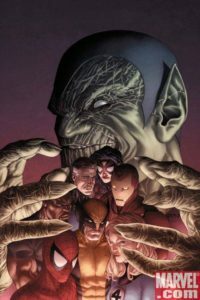 In Secret Invasion, The Skrulls pose the alarming question: have we really found all of the imposters? The result is a world-altering, line-wide crossover that – for once – takes its cues from years of accumulated continuity stretching back to the earliest issues of Fantastic Four! 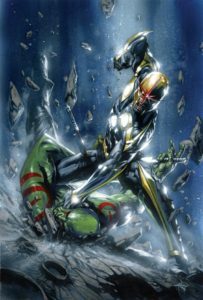 Secret Invasion #1-8 are collected in paperback and hardcover. The main limited series reads a little disjointed without the battles taking place in the tie-ins – particularly in Avengers titles. 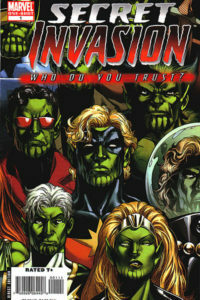 In 2018, Marvel issued a Secret Invasion omnibus (ISBN 9781302912154) that included all the major tie-in issues written by Brian Bendis. The full contents are Secret Invasion #1-8, Prologue; New Avengers (2004) #31-32 & 39-49; Mighty Avengers (2007) #7 & 12-20; and New Avengers: Illuminati (2007) #1 & 5. Alongside that omnibus, they released the Secret Invasion: Rise Of The Skrulls paperback (ISBN 9781302912468), collecting a concise history of the Skrulls via Fantastic Four (1961) #2, 18, & Annual 19; Avengers (1963) #97 & Annual 14; Silver Surfer (1987) #25; Marvel: The Lost Generation #11; Captain Marvel (2007) #1-5; Ms. Marvel (2006) #25-27; material From Fantastic Four (1961) #257, Marvel Westerns: Kid Colt And The Arizona Girl, Avengers: The Initiative Annual 1, and Secret Invasion: Who Do You Trust? Dark Reign was not a direct crossover or even a limited series, which makes explaining it a little difficult. Instead, it was a sort of villainous pallor that hung over the Marvel Universe for a year – totaling over 300 issues! – as a result of the conclusion of Secret Invasion. Without dropping any major spoilers, the final pages of Secret Invasion put a particularly despicable classic Marvel Villain in a position of power and trust in America. While he does his worst to undermine the traditional slate of Marvel heroes, his warped justice actually yields a few positive results for the American people – making this period even more confusing and twisted! The closest this sequence comes to a central series is a pair of framing collections – Dark Reign: Accept Change and Dark Reign: The List hardcover and paperback – collecting a series of eight one-shots: Avengers, Daredevil, Hulk, Punisher, Secret Warriors, The Amazing Spider-Man, Wolverine, X-Men. However, perhaps a better example of this period is the X-Men / Dark Avengers: Utopia crossover, collected in oversized hardcover and paperback. Years of galactic sub-plots come to a head in this stellar run of cosmic series, which follow the fates of the Inhumans, Shi’ar, and Kree, as well as heroes including Guardians of the Galaxy, Nova, and X-Men Havok, Polaris, and Rachel Summers. Inhumans / X-Men: War of Kings Omnibus collects the majority of the War of Kings storyline – Uncanny X-Men #475-486, X-Men: Emperor Vulcan #1-5, Secret Invasion: War Of Kings, X-Men: Kingbreaker #1-4, War Of Kings: Darkhawk #1-2, War Of Kings: Warriors #1-2, War Of Kings #1-6, War Of Kings: Ascension #1-4, War Of Kings: Savage World Of Sakaar, Nova #23-28, Guardians Of The Galaxy #13-19, War Of Kings: Who Will Rule?, and Marvel Spotlight: War Of Kings. 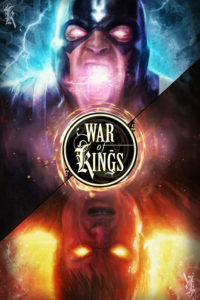 Road to War of Kings, which contains X-Men: Kingbreaker #1-4, Secret Invasion: War of Kings, and War of Kings Saga. This story continues in various places – the Inhumans/Kree thread in FF, Vol. 2 in hardcover and paperback, and the rift in space/time in Thanos Imperative (hardcover/paperback), followed by Annihilators (hardcover/paperback) and Annihilators: Earthfall. Seige is the grand finale of the epic three-year cycle of stories that began with Civil War. As a result of events in Dark Reign, the mythical city of Asgard has fallen to Earth – hovering above the American Midwest. While Earth’s heroes attempt to assuage locals and restore the city to its mythological home, Norman Osborn’s Dark Avengers and the anti-hero community sets their sights on shattering the home of the Norse Parthenon for good! Siege sounds like a Thor-centric event, but it’s much more about his extended supporting cast – particularly Loki. It also marks the end of Osborn’s multi-year arc. Collected in Seige hardcover and paperback along with Siege: The Cabal and a Free Comic Book Day issue, as well as oversized hardcover (which also collects the New Avengers and Dark Avengers issues, below). There was also a Siege Prelude paperback, which introduced the major themes of the event. New Mutants (2009) #11 in Siege: X-Men (above) and with Thor (below). See also New Mutants. Epilogues to Siege appear in Thor: Siege Aftermath. Osborn’s story continues in Osborn: Evil Incarcerated. Like Dark Reign before it, Heroic Age was a decentralized event without a main story. It put the focus back on tried-and-true Marvel heroes doing what they do best – saving the world. Since heroes being heroes is a more nebulous framing device than Dark Reign’s concept of villains taking over, not all comics bearing the Heroic Age banner have special significance. Two primary anthology titles were collected as Age of Heroes, with a number of the new series debuts collected as Heroic Age. It was primarily used as a platform to relaunch the Avengers line with Avengers, New Avengers, Avengers Prime, Secret Avengers, and Avengers Academy – plus solo books Black Widow, Hawkeye & Mockingbird, Steve Rogers: Super-Soldier. 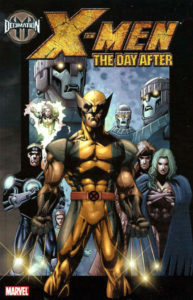 In the X-Men line, the Heroic Age coincided with the end of the massive Second Coming crossover. X-Men Vol. 3 launched under the banner of the Heroic Age, as did the Five Lights arc in Uncanny X-Men and Collision in X-Men: Legacy. A bloody, back-alley brawl of an event that allowed the street-level heroes of Marvel’s NYC a rare chance to shine without being shoehorned into a universe-spanning threat. Daredevil takes control of The Hand in Hell’s Kitchen, but with his new responsibilities he adopts a violent take on crime-stopping. As his crime-fighting friends decide how to confront the suddenly deadly Daredevil, a new Man Without Fear takes to the streets of New York. 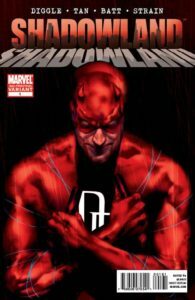 Daredevil: Reborn in hardcover and paperback acts as an epilogue to Daredevil’s arc in this event, which then leads to a new acclaimed series Daredevil by Mark Waid, Vol. 1 in hardcover and paperback. Stemming from events culminating in The Incredible Hercules: Assault on New Olympus and The Incredible Hercules: The New Prince of Power, this fight against the Chaos King and its tie-ins were outright despised by fans (except for Hercules fans, who thought it was a decent resolution to his title, if a bit of a letdown). The negative reception is only partially due to the impenetrable story. It’s also the fault of duplication – the X-Men had just endured a similar back-from-the-dead saga with Necrosha a year before, and the entire Marvel Universe was about to battle a god of fear in Fear Itself. Chaos War #1-4 are collected in paperback, with additional limited series issues collected in three other TPBs. Hercules’s story continues in Fear Itself: Herc hardcover. Children’s Crusade is a nine-issue limited series that follows the Young Avengers as they try to discern if two of their members – Wiccan and Speed – are related to the Scarlet Witch. Of course, that mission is bound to be tricky, since the Scarlet Witch has been missing in action since the end of House of M! How does this limited series classify as an event? Because it was released over the course of two years, and includes The Avengers including Spider-Man and Wolverine, a Pre-Schism X-Men including Magneto, and Dr. Doom as a villain – even though he is presently a hero in Fantastic Four! Children’s Crusade #1-9 are collected in Avengers: Children’s Crusade oversized hardcover, along with the Young Avengers: Children’s Crusade One Shot and material from Uncanny X-Men #526. Why have I placed it here when Marvel SVP Tom Brevoort claims that the running order of 2011 events is Fear Itself > Children’s Crusade > Spider-Island > Schism? Because that’s almost certainly not the case for X-Men and FF fans. Children’s Crusade kicks off with a brief scene with Magneto from Uncanny X-Men #526. All of Magneto and Rogue’s appearances in X-Men Legacy starting from #245 occur after Fear Itself, since they they all happen in a quick sequence that terminates with Schism – we know this due to the involvement of Legion and Rachel Summers. Also, due to Doom’s villainy, this absolutely must occur prior to the beginning of the FF series. If we trust Brevoort’s placement, we agree to put the first twelve issues of FF after Fear Itself. That clearly can’t be the case because of Thing and Invisible Woman’s participation in Fear Itself as members of FF, the issue of which is actually collected in Spider-Island’s companion book! Oh, and Magneto takes a brief trip with FF in X-Men, Vol. 3 #16-19 that includes Doom as a member of FF. And that doesn’t even mention how much suffering The Avengers (and the world) endure in Fear Itself, which goes without mention in Children’s Crusade. The much easier solution is that Children’s Crusade occurs directly prior to Fear Itself. Ta-Da! It creates very few conflicts. Another event with Thor and Asgard playing the most prominent role, though its effects reached into every corner – and nearly every title! – of the Marvel Universe. The Serpent of Asgardian legend rises in the form of a man, and he is determined to usurp control of Asgard and plunge the Earth into a worldwide epidemic of fear. To aid him in his battle, seven corrupting hammers descend upon Earth, empowering heroes and villains alike as ultimately powerful, unstoppable forces of evil. The main story played out in a seven plus three issue series. However, as has been the case with recent limited-series driven events, the limited contains only the main bash … story elements are spread out across the line of titles. Fans and critics generally disliked the main book, but applauded many of the tie-ins for excellent storytelling and action. 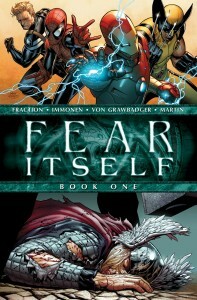 Fear Itself #1-7 are collected in hardcover and paperback (along with prologue “Book of the Skull). 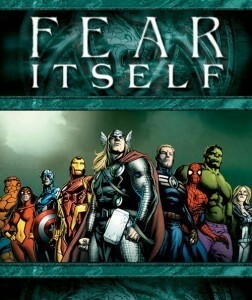 Fear Itself: Fellowship of Fear #1 is uncollected (or, content was spread between multiple books). It was a combination Saga recap and Handbook of characters. Fear Itself: The Monkey King #1 may be uncollected. Fear Itself: The Worthy #1-8 was a digital series collected with Spider-Man, above. A new, short-lived Defenders series launched in the wake of this event with Defenders by Matt Fraction hardcover. Alpha Flight continued for an additional four issues, collected Alpha Flight by Greg Pak and Fred Van Lente, Vol. 2 hardcover. 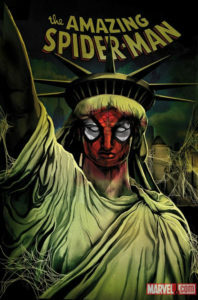 A rare spider-centric crossover that reached past the Spider-Man family of books to pull in other NYC heroes like Black Panther, Luke Cage, The Avengers, and Cloak & Dagger. This was well-received by fans and critics as a fun, fast-paced story worthy of a crossover. Collected in Spider-Island oversize hardcover and paperback, with supporting issues collected in Spider-Island Companion oversize hardcover and paperback. Below, I’ve listed what those two books contain. 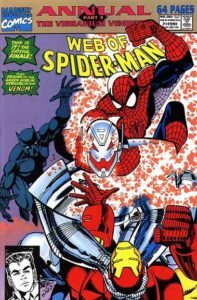 Note that the only ongoing series to cross over into the event along with Amazing Spider-Man were Venom, Herc, and Black Panther – everything else was contained to a mini-series. Spider-Island: The Infested Prologues From Amazing Spider-man (1963) #659-660 and #662-665, Amazing Spider-Man (1963) #666-673, Venom (2011) #6-8, Spider-Island: Deadly Foes, and material from Spider-Island Spotlight. Companion: The Amazing Spider-Girl #1-3, Spider-Island: Cloak & Dagger #1-3, Spider-Island: Deadly Hands Of Kung Fu #1-3, Herc #7-8, Spider-Island: Avengers #1, Spider-Island: Spider-Woman #1, Spider-Island: I Love New York City, Black Panther #524, Spider-Island: Heroes For Hire, and material from Spider-Island Spotlight. In 2012 Marvel pitted two of their big three franchises against each other over the coming of the Phoenix Force! 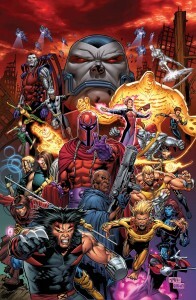 Characters: While the entire cast of X-Men and Avengers participate, the main action is driven mostly by Cyclops, Emma Frost, Namor, Colossus, Magik, Hope, Scarlet Witch, Iron Fist, Iron Man, Captain America, and Spider-Man, which appearances by Hawkeye, Luke Cage, Red Hulk, Thing, Storm, and Magneto. 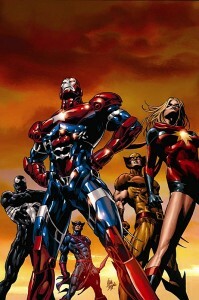 The crossover itself consisted of two main series – Avengers vs. X-Men and Avengers vs. X-Men: Vs – plus a number of tie-in issues across both lines of books – though Marvel’s Editor-in-Chief promises the crossing will only occur if “Avengers” or “X-Men” is part of a book’s actual title. 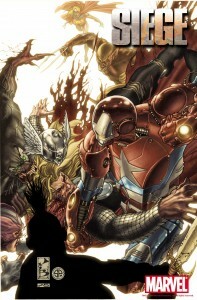 Road to AvX TPB collects key lead-up issues from the past few years. The entire Avengers: Children’s Crusade series can also be considered a prologue, as can Avengers: X-Sanction in hardcover and paperback. The oversized hardcover Avengers vs. X-Men collects Collecting Avengers vs. X-Men #0-12, AVX: VS #1-6, Avengers vs. X-Men Infinite Comics, and material from Marvel Point One. If you want Avengers vs. X-Men in paperback, you’ll need to pick up the pair of Avengers vs. X-Men and Avengers vs. X-Men: Vs (ISBN 0785165207). To grab all of the tie-ins in one place, you simply need Avengers vs. X-Men Companion, which collects all of the tie-ins listed below as well as the epilogue from Consequences. The epilogue is the five-issue Avengers vs. X-Men: Consequences (ISBN 0785166467). A-Babies vs. X-Babies #1 – Collected in the Companion and in Young Marvel TPB. Long-time Avengers scribe Brian Bendis began teasing an apocalyptic future ruled by Ultron early in his Heroic Age run on The Avengers. 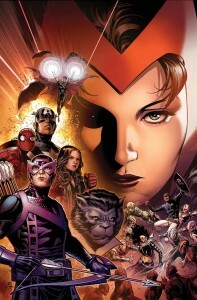 Though Bendis broke ground on the series with artist Brian Hitch around that time, with Avengers vs. X-Men on the horizon, Marvel delayed the event from 2012 to 2013. In retrospect, you can feel how the two events are interchangable in their potential to set up Marvel Now. Fans widely panned the event due to its awkward fit into continuity and lack of action. It’s a strangely somber affair – half-composed of battle-scarred heroes wandering through post-apocalyptic cities, the other half featuring the unlikely time-traveler Wolverine traveling with unlikely ally Invisible Woman. Due to the significant shift in timing of this event and the self-contained nature of the story, it did not include many tie-ins – but those that it did are universally strong, if a bit depressing. The oversized hardcover Age of Ultron collects Age of Ultron #1-10 as well as all of its tie-ins: Avengers Assemble 14AU -15AU , Fantastic Four 5AU , Fearless Defenders 4AU, Superior Spider -Man 6AU , Ultron 1AU , Uncanny Avenger s 8AU, Wolverine & the X-Men 27AU, and Avengers 10AI. A pair of paperbacks split the series between the main event and tie-ins. Billed as “the first crescendo” of Jonathan Hickman’s planned multi-year run on The Avengers, Infinity brings back Thanos as an ultimate bad-guy threatening both Earth in specific and the universe as a whole. As a result of the event, The Inhumans and their Terrigan Mists are thrust into prominence in decentralized event lead by writer Matt Fraction. 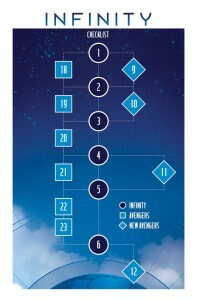 The main event Infinity runs through Infinity #1-6 and directly relates with nine accompanying issues of Avengers – Avengers #18-23 and New Avengers #9-12. The continuity of those issues is shown on the map at the right – put together by Hickman himself! Characters: Thanos, The Builders, The Avengers – particularly, Captain America, Captain Marvel, & Ex Nihilo, The Illuminati – Iron Man, Black Bolt, Dr. Strange, Mr. Fantastic, Namor, Black Bolt & Beast plus their prisoner Black Swan, and The Inhumans. 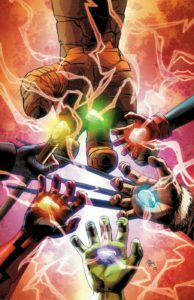 Infinity #1-6 is collected (in story order!) in oversize hardcover and paperback, which also includes New Avengers #7-12, Avengers #12-23, and Infinity Infinite Comic #1-2 (Infinite comic may not appear in paperback). The same material minus the prologue from Avengers #12-13 and the Infinite Comic was recollected in oversize hardcover format in 2018 as Infinity by Starlin & Hickman Omnibus (along with the 1992 Infinity Gauntlet). 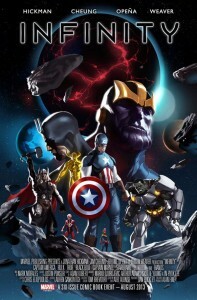 The entire Jonathan Hickman run on Avengers through the end of Infinity is collected in Avengers by Jonathan Hickman Omnibus, Vol. 1 – Avengers (2012) #1-23, New Avengers (2013) #1-12, and Infinity Free Comic Book Day and Infinity #1-6 (and Infinity: Against The Tide Infinite Comic #1-2). Plus, this adds two stories not recollected elsewhere – Astonishing Tales: Mojoworld (starring Cannonball and Sunspot) and material from Shang-Chi: Master of Kung Fu (2009) one-shot. 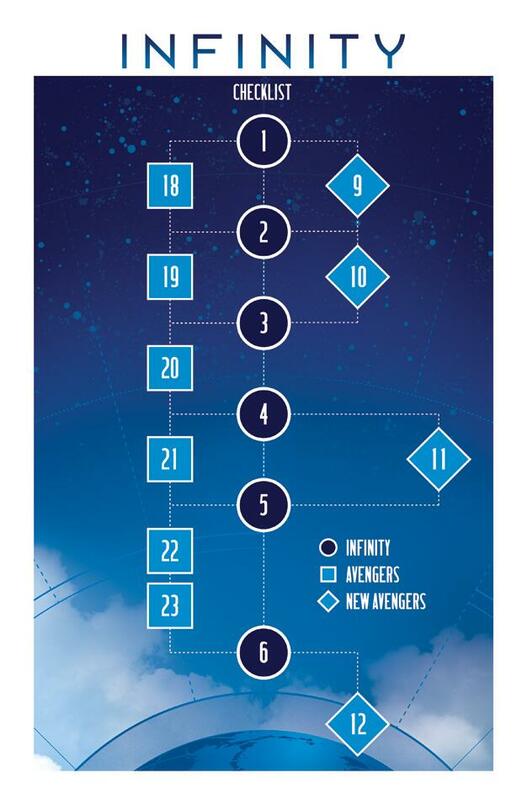 All of the Infinity tie-in issues (listed below in bullets) are collected in Infinity Companion Oversize Hardcover. 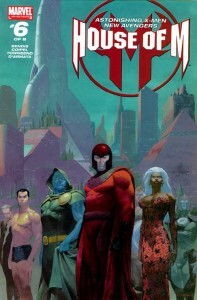 Inhumanity consists of a new series – Inhuman – plus several tie-ins, collected in the Inhumanity oversized hardcover and paperback. However, several other series displayed the effects of Inhumanity – notably, the launches of Ms. Marvel and New Warriors. Marvel’s omnipotent Watcher has been murdered, and the secrets his eyes have witnessed are being released across the Earth! 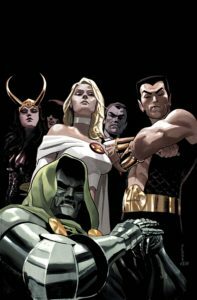 The main series will follow an unlikely investigative team including Black Panther, Emma Frost, Moon Knight, Punisher, and Thor as they seek the murderer. Meanwhile, many titles will tie-in and examine the impact of long-kept secrets as they are released! Original Sin #0-8 & Original Sins #1-5 (plus material from Marvel Now .1) are collected in Original Sin oversized hardcover. Original Sins stars Young Avengers. The two series were later collected separately in paperback as Original Sin and Original Sins (the latter of which includes Annual 1 – which is not presently listed as being included in the hardcover). All Original Sin tie-in issues (listed below in bullets) are collected in Original Sin Companion oversized hardcover. Operation S.I.N. : Agent Carter #1-5 is a follow-up series that is a flashback to the 19050s but also a tie-in to the event. It is collected in paperback alongside Captain America and The First Thirteen. 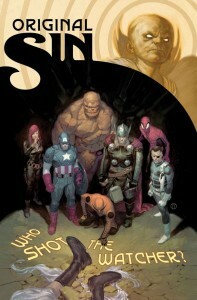 The “secrets revealed” concept of Original Sin made it easy to tie-in any Marvel title without them directly impacting the main story of the event – in fact, hardly any of them do. Instead, they are loosely plotted around some revealed secret that changes the course of their plot. The Red Skull uses his newfound psychic powers to flip the roles (and traits) of heroes and villains, with terrifying results both for the Marvel Universe and the heroes themselves. This event rose from the ongoing plot of Uncanny Avengers, and despite a few tie-ins it is largely contained to the event book itself. The stories immediately leading up to the event are collected in Uncanny Avengers: Axis Prelude, which includes Uncanny Avengers #23-25 & Annual 1 and Magneto #9-10. 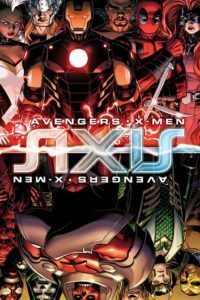 Avengers & X-Men: Axis #1-9 are collected in oversized hardcover and paperback. Specific hero vs. villain grudge matches are detailed in Axis: Revolutions, collecting #1-4 of that series. Magneto, Vol. 2: Reversals – This contains #9-10 which are collected above, but adds more context in the run-up to the opening confrontation of Axis and Magneto’s state of mind, in general. The first spider-centric event since 2011’s Spider-Island! This event features every spider-powered character ever – plus introduce a few new ones – as a Spidey-villain hunts down super spiders in every dimension. Note: the collection information for this event changed significantly from what was originally solicited at the end of 2014. They collect Amazing Spider-Man #7-15, Superior Spider-Man #32-33, Material from Free Comic Book Day 2014, Spider-Verse #1-2, Spider-Verse Team-Up #1-3, Scarlet Spiders #1-3, Spider-Woman #1-4, Spider-Man 2099 #6-8. 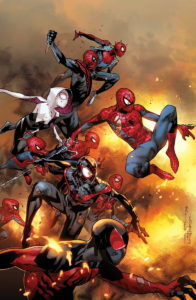 Amazing Spider-Man: Edge of the Spider-Verse #1-5 as Amazing Spider-Man: Edge of the Spider-Verse. Issue #1 & 5 is recollected in Spider-Man: Spider-Verse – Spider-Men. Issue #2 introduced Spider-Gwen and has been recollected widely with her material; see Spider-Gwen. Jonathan Hickman’s Secret Wars is the result of all the various Marvel universes colliding into one savage battleworld, merging realities and pitting factions from famous Marvel stories against each other. Secret Wars Prelude gathers the essential beginnings of the story, while all of Avengers and New Avengers act as a lead-in to this event. The period directly preceding the event ties to it most closely. That is collected as Avengers: Time Runs Out in oversize hardcover, which collects Avengers #35-44 and New Avengers #24-33. Silver Surfer #13-15 in Vol. 3: Last Days – In perhaps the most significant Last Days tie-in (and the only one to occur during Secret Wars), Silver Surfer and Dawn have the chance to remake the universe from their own experiences. Spider-Woman #10 in Vol. 2: New Duds – A clever issue of Spider-Woman getting reeled back into Avengers business by Black Widow, placing her with the refugees in the opening scenes of Secret Wars. None of that is essential to read to enjoy the main event – it has absolutely zero impact on the story. Secret Wars #1-9 and Free Comic Book Day 2015 Secret Wars #0 are collected in an oversized hardcover and paperback. Secret Wars is split into two major types of tie-ins – Battle World (dealing with the construction and conflicts of the world) and War Zones (bash-em-up stories of direct conflict). In some cases, books continued with the creative time from the titles that lead into them and offered some sense of continuity of story – those are noted below. A few continue directly into new series – they are also noted. Korvac Saga is an extension of Guardians 3000 – it includes the preceding Guardians 3000 #6-8. Secret Wars: Agents Of Atlas #1 are collected in Journal/Battleworld, above. Secret Wars, Too is a collection of small, funny, sometimes-What-If stories from a number of different series. Civil War II invents a new inciting incident to divide the Marvel Universe – this time, putting the Inhumans and a particular future-seeing member of their race in the middle of a divide lead by Iron Man on one side and Captain Marvel on the other. 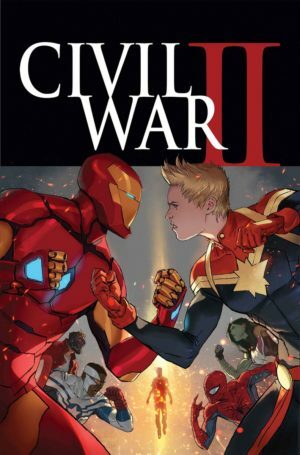 Civil War II #0-8 and Free Comic Book Day 2016 is written by Brian Bendis and collected in oversize hardcover. First, Death of X #1-4 works as a sort of prelude to this event. It depicts previously unseen events happening in the months directly following Secret Wars II as the Terrigen cloud on earth becomes toxic for mutants. Inhumans Vs. X-Men #0-6 by Charles Soule and Jeff Lemire in oversize hardcover and paperback. This is a light-weight, light-on continuity event that sees massive monsters break loose across the Marvel Universe as penned by Cullen Bunn with a rotating cast of Marvel’s top artists. Monsters Unleashed #1-5 are collected in Monsters Unleashed: Monster-Size Hardcover, which is EVEN TALLER than an omnibus! Seriously, it’s really huge, it might not fit on your shelf. There’s also a (normal size) paperback version. 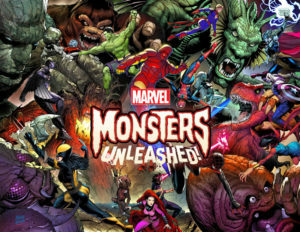 Monsters Unleashed Prelude doesn’t really collect lead-up issues, so much as recent or significant appearances by the monsters in question from Fearless Defenders #8, Marvel Zombies (2015) #1, Moon Girl And Devil Dinosaur #1, Totally Awesome Hulk #2-3 and material from Strange Tales (1951) #73 & 90, Tales To Astonish (1959) #11-13, 15, 17, 19, & 23; and Tales Of Suspense #15, 17, 19 and 22. A new, ongoing Monsters Unleashed volume continued out of this series for Volume 1: Monster Mash and Volume 2: Learning Curve. Avengers: Standoff (oversize hardcover / paperback) includes Welcome To Pleasant Hill Prologue #1, Assault On Pleasant Hill Alpha #1, Agents Of S.H.I.E.L.D. #3-4, Uncanny Avengers #7, All-New All-Different Avengers #7-8, New Avengers #8-10, Captain America: Sam Wilson #7-8, Uncanny Avengers #8, Illuminati #6, Howling Commandos #6, Assault On Pleasant Hill Omega #1. Available in oversize hardcover. Then, after a year of development (and stories in both Captain America titles), Secret Empire broke out. Secret Empire (oversize hardcover / paperback) collects Secret Empire (2017) #0-10, Omega, and Free Comic Book Day 2017. Secret Empire tie-ins were collected in two paperbacks. Secret Empire: Brave New World collects the five-issue supporting anthology series. Secret Empire: United We Stand collects a number of supporting issues, all of which were strong reads that added context to the main series: Secret Empire: United #1, Secret Empire: Underground #1, Secret Empire: Uprising #1, and Uncanny Avengers #24-25. A year after Secret Empire began, Doctor Strange created an epilogue for the story with Damnation, his attempt to right one of the greatest wrongs of the corrupted Captain America’s administration – the destruction of Las Vegas. Collects Damnation (2018) #1-4, Johnny Blaze: Ghost Rider (2018) #1, Doctor Strange #386-389, Iron Fist #78-80, Ben Reilly: Scarlet Spider (2017) #15-17. (Probably also collects Doctor Strange #390). 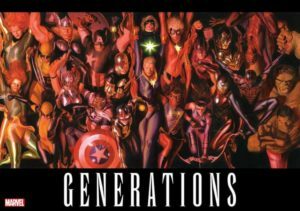 Generations and Marvel Legacy are two events that aren’t really events – they’re just included here because so many other titles refer to them! 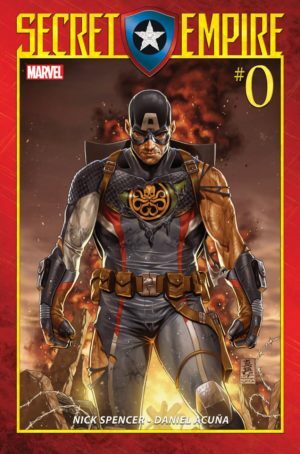 The ten Generations one-shots spin out of a single moment in Secret Empire #10. Each one of them sends a second-generation hero who has inherited a mantle back in time to have a singular experience with their mentor. None of these connect to Secret Empire! Many of them are written by the actual ongoing writers of their series, who incorporated them into their continuing runs to various degrees – none moreso than Hawkeye, which actually continued its story from the one-shot. Generations (oversize hardcover / paperback) collects the 10 standalone Generations one-shots. Then, Marvel released a one-shot to kick off their “Marvel Legacy” era. This one-shot did a peculiar double-duty, giving two-page previews of plot upcoming in several Marvel titles but also teasing a broader Avengers story that wouldn’t come to fruition until Jason Aaron took over the franchise in Fresh Start over six months later. Marvel Legacy (oversize hardcover / paperback ISBN 9781302911027) collects the oversized Marvel Legacy one-shot and all of the three-page “Marvel Primer” stories that ran in initial Legacy titles to help readers catch up. Writer Gerry Duggan asked Marvel to cancel his run on Guardians of the Galaxy because his plans for the Guardians were much bigger than a single series could contain! 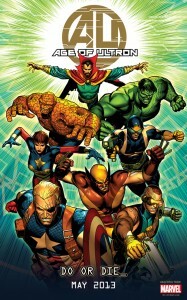 The story arc that could have ended the Marvel Legacy volume of Guardians became Infinity Countdown, an event series that merited several tie-ins. The action from that story exploded into Infinity Wars at the beginning of Marvel’s Fresh Start. The culmination of over six years of Jason Aaron’s epic run on Thor, War of the Realms brings the ongoing conflict between Thor and Makelith to a head. 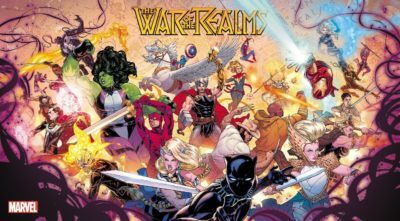 War of the Realms Prelude– An introductory volume with issues and subplot pages that lead up to the event. I have been reading chronologically through the events. It turns out that the 1992 annual crossover “The System Bytes” has one more part. Part 3 is Wonder Man Annual #1. Wow, thanks for that catch, Stephen! I just added it. I’d love to hear more about how your chronological read is going – I’ll send you an email when I’m done writing my next few posts. I keep coming back to this site, over and over again, because I am trying to collect as many of these story arcs in order as I can. I copied everything into a notes tab on my phone as a checklist sort of, and have been using that as a reference every time I want to go and grab a new book. This is absolutely my go to guide for anything I need to know for my collection, so thank you so much for putting in all of this time and effort. First of all, I love this site! It’s been an awesome resource that I continually reference to complete my comic book collection. I just wanted to add something that you may have overlooked… for the Secret Wars Warzones, there’s a title called Captain Marvel and the Carol Corps. Have you thought of expanding to include other crossovers such as Korvac Saga, Thanos War, Avengers/Defenders war, Kree/skrull war, mutant massacre, fall of the mutants, dark Phoenix saga, messiah complex, black vortex. This page is explicitly for crossovers that extend across several Marvel lines, although I do make the occasional exception for something as massive as Spider-Verse. Everything in your comment was either a single-book storyline or a minor single-line crossover with a tie-in or two, with the exception of Black Vortex. That one is right on the line of what I typically include, but Marvel didn’t especially promote it as an event so it didn’t feel “in scope” to me. That all said, I think the idea of a directory page with a list of super-classic Marvel storylines and where to find them on CK is a great one! That’d be sweet. Keep up the great work!